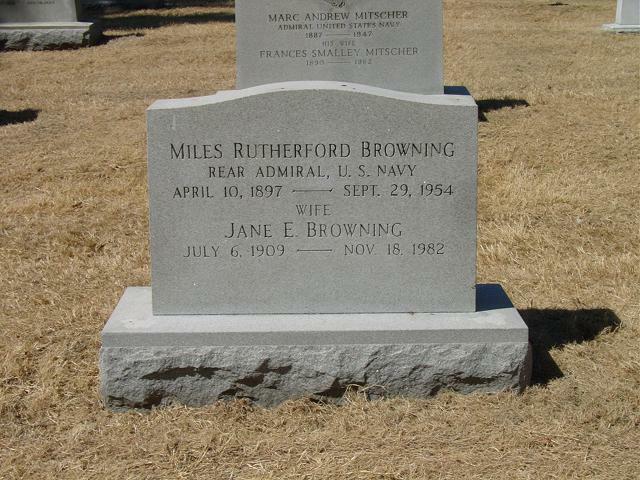 Miles Rutherford Browning (April 10, 1897 - September 29, 1954) served as an officer of the United States Navy in the Atlantic during World War I and in the Pacific during World War II. A pioneer in the development of aircraft carrier combat operations concepts, he is noted for his aggressive aerial warfare tactics as a captain on the USS Enterprise during World War II. His citation for the Distinguished Service Medal (the highest U.S. Navy award at that time, second only to the Medal of Honor in merit) states: "His judicious planning and brilliant execution was largely responsible for the rout of the enemy Japanese fleet in the Battle of Midway." Miles Browning was born in Perth Amboy, New Jersey, to New York City stockbroker Oren Fogle Browning, Jr. and Sarah Louise (Smith) Browning, a poet descended from Native American Mohawks in upstate New York. He attended public schools before his appointment to the U.S. Naval Academy, Annapolis, in 1914. He graduated early, commissioned Ensign with the Class of 1918 on June 29, 1917. During World War I, Browning served on the USS Oklahoma, a battleship of the U.S. Atlantic Fleet, until February 1918. He then had duty in connection with fitting out the USS New Mexico. In June 1918, he joined the French cruiser Lutetia, and was senior American Naval Officer aboard while she operated with Cruiser Force, Atlantic Fleet, through the end of the war. For four years following the war, Browning had consecutive service afloat, on the battleship USS Pennsylvania (flagship of the Atlantic Fleet), the destroyer USS McKean, and as Engineer Officer of USS Crane, and later USS Howard (destroyers operating with the U.S. Pacific Fleet). Lieutenant Browning joined USS Badger in 1920, serving as Executive Officer until transferred a year later to similar duty as XO of USS Kidder. On May 20, 1922, Browning married San Francisco socialite Catharine Isabella Parker, stepdaughter of Vice Admiral Clark H. Woodward. From 1922 to January 1924, Browning served as Senior Patrol Officer on the cruiser USS Charleston and the destroyer USS Thompson, operating out of Naval Station San Diego. During that time, his only daughter, Cathalene Parker Browning, was born in San Diego; her son is American comedian Chevy Chase. In January 1924, Browning reported to Naval Air Station Pensacola for flight training. 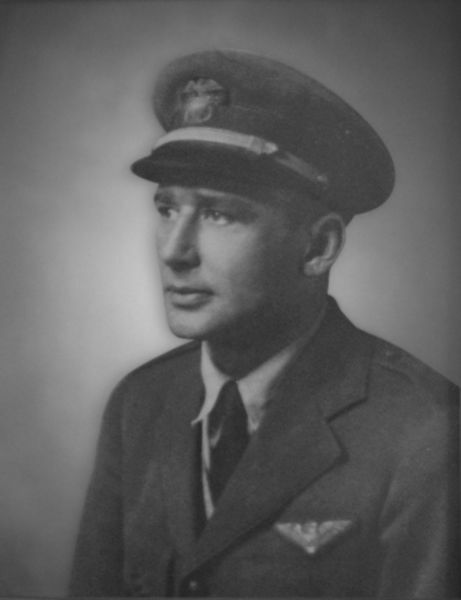 He showed exceptional skill in the cockpit, but also exhibited a "wild streak" which struck his squadron mates as "potentially dangerous." Designated Naval Aviator on September 29, 1924, he became one of America's earliest navy combat pilots, joining USS Langley, the U.S. Navy's first aircraft carrier, which had been converted from the transport USS Jupiter (two of whose sister ships, USS Cyclops and USS Nereus, vanished without a trace in the Bermuda Triangle area). From January 1925 until May 1927, Browning was assigned to Observation Squadron 2, attached first to the minelayer USS Aroostook, later to the battleship USS Idaho. Advanced to Operations Officer, he served for two years at Naval Station Norfolk, Virginia. Promoted to Naval Flight Officer, he was assigned his first command in July 1929: Scouting Squadron 5S, the aviation unit of the light cruiser USS Trenton. During that time he performed additional duty on the staff of the commander of Light Cruiser Division Two of the Scouting Fleet (USS Trenton, flagship). As an early combat aviator, Browning was not only instrumental in the development and implementation of fighter aircraft tactics and strategy, he also impacted the manner in which naval warplanes were designed and built. In July 1931, he reported to the Bureau of Aeronautics to serve in the Material Division (Design), and spent the next three years helping to design and test combat aircraft, until June 1934. During that period, as a test pilot, he was laid up in a San Diego naval hospital after crashing a plane there in 1932. The monoplane fighters which Browning and others piloted went through numerous upgrades in both structure and function, every design change hotly debated by men whose very lives were at stake. Browning was part of the group of progressives that pushed for development of a high-performance fighter, with maneuverability secondary to speed. These men felt that a true fighter had to be fast enough to quickly overtake and shoot down enemy planes. Unfortunately for Browning and the other progressive thinkers, the Bureau of Aeronautics continued to emphasize maneuverability, climb, and flight ceiling at the expense of speed and other characteristics that the progressives argued were more important. If the bureau had been more receptive to the emphasis on speed, the United States might have entered World War II with a more advanced high-performance fighter. Browning was next assigned command of Fighting Squadron 3B, based back on the USS Langley and later on USS Ranger, the first American warship built from the keel up as an aircraft carrier. He served in that capacity until June 1936, when he reported to the Naval War College in Newport, Rhode Island, for postgraduate studies with additional duty at the Naval Torpedo Station there. Upon completion of his junior year, he became one of the first naval instructors at the Air Corps Tactical School at Maxwell Field in 1937, training a new generation of fighter pilots while continuing his advanced studies in combat theory, national security policy, airborne command and control and joint military operations. An example of Browning's tactical logic is a 13-page, single spaced, typewritten thesis on carrier warfare that he prepared while at the Naval War College in 1936, the year that Nazi Germany allied with Fascist Italy and Imperial Japan. Browning's essay anticipated the flaw in Japanese carrier execution which he would exploit so decisively during the coming war. After completing his academic work, Browning was appointed to Admiral William F. Halsey's staff in the new billet of Air Tactical Officer. In June 1938, he joined the United States' second new aircraft carrier, USS Yorktown, to serve as commander of Yorktown's carrier air wing. Browning personally developed and organized the Fleet Aircraft Tactical Unit based on Yorktown, and commanded it for two additional years. When Halsey became the commander of Air Battle Forces two years later, Browning remained on his staff as Operations and War Plans Officer and became Halsey's chief of staff in June 1941. From the onset of U.S. involvement in World War II, Browning provided tactical counsel to Halsey from the bridge of Halsey's flagship USS Enterprise. With the United States Pacific Fleet nearly destroyed, USS Enterprise and her battle group took up forward defensive positions west of Hawaii. Eight of the fleet's nine battleships had been trapped in the harbor, four of them sunk and four heavily damaged, along with three of the fleet's eight cruisers present during the dawn attack. With her battleship force crippled, defense against further attacks on the United States and her territories was left to her three aircraft carriers stationed in the Pacific: Enterprise, and the converted battlecruisers Lexington and Saratoga. Designated flagship of the Pacific Fleet, Enterprise sailed in January 1942 to protect American convoys reinforcing Samoa. Soon, though, under the aggressive leadership of Halsey and Browning, Enterprise took up the offensive. In February and March of 1942, Browning directed numerous daring air raids on Japanese bases at Kwajalein, Wotje, and Maloelap in the Marshall Islands, and blasted enemy installations in the Gilbert Islands, Marcus Island, and Wake Island. Halsey gave credit for much of his own remarkable military success to his chief of staff, and recommended Commander Browning for a spot promotion to the rank of captain. So dramatic were Browning's air raids on Japanese island bases that Life magazine dubbed him "America's mastermind in aerial warfare." Browning's promotion was approved by CINCPAC that April following the "Doolittle Raid", in which Browning himself played a role in both planning and executing. Dubbed "Jimmy Doolittle's Raid" by the American press, the daring scheme launched sixteen Army Air Force long-range bombers, led by Lt. Col. James H. Doolittle, from the deck of the carrier USS Hornet, with Enterprise providing combat air support. The squadron dropped bombs on Tokyo at high noon on April 18, 1942, completely surprising the Japanese and giving the beleaguered American troops and public a much-needed boost in morale. Halsey fell ill on the Enterprise on their way back from the successful Doolittle bombing. Rear Admiral Raymond A. Spruance, Halsey's hand-picked successor, inherited Browning and his staff just prior to the Battle of Midway. Spruance, who had commanded only battleships since the beginning of the war, was concerned about commanding a carrier group because he had no prior aviation or carrier experience. Halsey reassured him, though, telling Spruance to rely on his battle-hardened staff, especially Browning. Unfortunately, Browning had limited social skills, and Spruance found it difficult to get along with his chief of staff during and after Midway. Military historian Samuel Eliot Morison referred to Browning as "one of the most irascible officers ever to earn a fourth stripe, but he was a man with a slide-rule brain." Others said he had a "calculator brain" and "a superintellect that evoked praise – often begrudging – from his superiors." Browning is commonly described as "crusty and brawling,"clever, daring, exceptionally aggressive and uncontrollable. He was by no means a deft social mixer; by most reports he was disdained the friendship of many of the very flag officers with whom he served. He was willful, arrogant, a hard drinker, and violently tempered. Despite his unpopularity, however, he was a brilliant tactical officer. Midway would be a critical battle for the United States and its allies. After the devastation of its battleships at Pearl Harbor six months earlier, the U.S. Navy was forced to place all its hopes on its small aircraft carrier force, which was dwarfed by the strength of Japan’s Combined Fleet. All parties knew that this pivotal encounter might very well determine the outcome of the war in the Pacific. Browning was the officer charged with directing the impending battle as the Imperial Japanese Navy, undefeated for over 350 years, bore down on Midway Island. American intelligence had decoded Japanese messages and knew roughly where the Combined Fleet would be headed. While unaware of that breach in radio security, the Japanese changed their codes out of protocol while under sail for the strategically crucial U.S. airbase at Midway. The Imperial Fleet, under Admiral Isoroku Yamamoto, knew that they would meet resistance, and intended to draw whatever was left of the American fleet into a battle wherein any remaining U.S. naval warships could be destroyed. Yamamoto's second-in-command, Vice Admiral Chuichi Nagumo, the hero of Pearl Harbor, was so confident in their plan that he failed to anticipate carrier-based aerial attacks from any of America's remaining carriers, and presumed that the heavily damaged Yorktown sank in the Battle of the Coral Sea. Offical accounts credit Browning's tactical genius and carrier operations experience with winning the battle. Spruance wanted to wait to launch fighter aircraft until the Japanese ships were within 100 miles. Browning, however, had figured out that the Japanese would commit to another strike on Midway Island and that he could catch them off guard. By ordering Enterprise 's fighters to attack the Japanese task force on sight while the Japanese planes were committed to fueling and rearming operations on deck, Browning caught the Japanese ships without adequate protection and was able to sink all four of Japan's big carriers, as predicated by his 1936 tactical thesis. In the aftermath of the battle, Browning urged a search and destroy mission against the enemy's retreating forces, as Halsey certainly would have. Spruance opted to hold back, however, uncertain of what lay beyond the ocean horizon. Despite the contention between Browning's brashness and Spruance's sly caution, the day's task had been accomplished. What was left of Japan's Imperial Fleet escaped to the west, where it carried on a losing fight for the next three years. The decimation of the Japanese Navy at Midway empowered President Franklin D. Roosevelt to turn America's military attentions from the Pacific theater to Europe, culminating in the subsequent victory of Allied Forces in the Battle of the Atlantic. Browning, unfortunately, was a man of tremendous contradictions, and his darker side would see to his professional demise following Midway. At that moment of triumph, in the summer of 1942, he had an affair with the wife of a fellow officer. That breach of sacred code, combined with his drinking and unstable temperament, would eventually derail his career and lead later chroniclers to virtually write him out of military history. Regardless of this damaging personal incident, Browning resumed combat duties in October 1942, when Halsey was given command of the South Pacific theater, where Allied fortunes had turned for the worse. Browning's sage tactical advice helped Halsey to execute the command miracle in the Solomon Islands that reversed the declining situation in that war-swept region. Like Midway, the Guadalcanal Campaign was another critical "turning point" in the Pacific war. The first major offensive by combined Allied forces against Japanese-held territory, it was a desperate ongoing sea, air and ground campaign requiring continuous, almost daily, aircraft actions orchestrated by Browning. Repeated Japanese counterstrikes were repelled while the entire South Pacific Force – including U.S and Allied army, navy and marine forces – was run by Halsey, Browning, a handful of staff officers and some fifty bluejackets. Their tactics, and the sacrifices of thousands of soldiers, sailors and marines under their command, resulted in the historic naval victory at Guadalcanal in early November 1942. Again, Halsey gave Browning credit for his success. In a New Year's Day 1943 letter to Admiral Nimitz (CINCPAC) concerning Browning's precarious career situation, Halsey wrote, "Miles has an uncanny knack of sizing up a situation and coming out with an answer." Admitting that his chief of staff was "decidedly temperamental," Halsey begged Nimitz not to break up "this partnership" between himself and Browning, writing, "I am almost superstitious about it." Several days later, however, Browning antagonized visiting Secretary of the Navy Frank Knox, earning himself another powerful enemy who then urged that Browning be replaced. Admiral Ernest King, commander of the Indo-Chinese area and another old enemy, concurred. Halsey, soon to become a Fleet Admiral, instead pushed for a promotion to Commodore for Browning. In March 1943, Browning married Jane Matthews, the woman with whom he had the 1942 affair; she was his fourth and last wife. Browning was detached from Halsey's staff in July 1943 to become the commanding officer of the new USS Hornet (CV-12), built to replace CV-8, lost in October 1942 at the Battle of the Santa Cruz Islands. During his tenure of command, Browning launched massive aerial raids against Japanese bases in the Pacific, including Palau, Truk, and Ponape, and provided carrier-launched air support during the Allied invasion of New Guinea, the Jayapura operations, and the Battle of the Philippine Sea. In the spring of 1944, during a nighttime showing of a film on Hornet's hangar deck, someone discharged a CO2 canister and triggered a stampede. In the chaos, two sailors fell overboard, and one of them drowned. A board of investigation was ordered, which criticized Browning's command. The ensuing ruin of his career, "one of the great wastes to the American prosecution of the war," resulted, ironically, from nothing having to do with combat. Browning was removed from command of Hornet in May 1944 and reassigned to the Command and General Staff College at Fort Leavenworth, Kansas, where he taught carrier battle tactics for the final months of the war. Halsey was given command of the carrier-oriented 3rd Fleet during 1944-1945, but with his old chief of staff landlocked, he made grave mistakes that Browning may well have avoided. Browning toured Japan after its surrender in 1945, and theorized that the rampant growth of vegetation in Hiroshima and Nagasaki was perhaps a side effect of the atomic bomb blasts there. [verification needed] He retired from active duty on January 1, 1947, just short of his 50th birthday, and was retroactively promoted to Rear Admiral. Seven years later, on September 29, 1954, Browning died of systemic lupus erythematosus, and was buried at Arlington National Cemetery. This page is based on the copyrighted Wikipedia article; it is used under the GNU Free Documentation License. You may redistribute it, verbatim or modified, providing that you comply with the terms of the GFDL." Posted: 2 December 2006 Updated: 25 June 2007 Updated: 21 August 2007 .